Nobody expected things to happen this fast – least of all the European Union. On Friday, the German, Polish and French foreign ministers had finally managed to persuade the now deposed Ukrainian President, Viktor Yanukovych, to agree to wide-ranging reforms, while their colleagues in Brussels were busy approving sanctions. Just one day later, Yanukovych vanished from the political radar. Yulia Tymoshenko, the opposition figurehead for whom the West had fought for so long, has been freed. The Ukrainian parliament has set presidential elections for May. The road to democracy – and to convergence with the EU – is clear again. However, the EU must be careful not to be overwhelmed by feelings of triumph. It must resist the temptation to align itself on one political side. Yanukovych and his supporters, including Russia’s President Putin, have long called the EU biased – and with good reason. 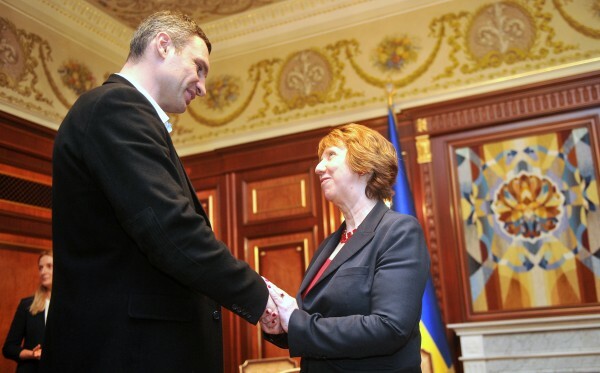 Tymoshenko and the boxing-champion-turned-politician Klitschko are the EU’s darlings. But Yanukovych’s party, and his supporters, must continue to play a political role. Otherwise, there’s no way the country will find peace. At this point, the EU must not exaggerate its role in Ukraine. It is there to accompany the country politically, not to tell it what to do. German, French, or Polish conceptions of democracy cannot be applied one-to-one: Ukraine has to find its own way. Perhaps the most important thing is that Brussels must continue its dialog with Moscow. The greatest mistake of all would be for the EU to ignore Russian interests and turn Ukraine into a kind of buffer against Russia. This would not only rip Ukraine apart; it could develop into a serious conflict with Russia, with wide-reaching and potentially devastating consequences. Regardless of who takes over in Ukraine, he or she will have to tackle grave financial and economic problems that could destroy any steps taken in the direction of democracy. The EU must increase its aid to Ukraine. Not unconditionally, of course, and not simply to compete with Russia; but all offers made so far sound much too small. Let us provide some context. The chance to attract this large, important country towards the West may not come again in a hurry. It’s not the time to be miserly. And another – quite practical – move that would cast the EU in a positive light would be to allow Ukrainians to travel. They must be offered the prospect of freedom to travel to Europe without a visa. In Russia, but also in the West, there are many observers talking about a great geostrategic power struggle currently taking place in Ukraine. These people need to rethink. Ukraine doesn’t want to be an object. If the people there could choose freely, they probably wouldn’t want to commit themselves wholly either Russia or to the EU. And they shouldn’t have to: If Ukraine is supposed to be a bridge between East and West, then its people should at least be welcome in both places. It will be hard to persuade Putin of this, as he appears to be stuck in the mental trap of the Cold War, but it is the case, nonetheless: A stabile, prosperous Ukraine with economic ties to both sides is also in Russia’s interests. Putin’s concerns, it must be said, could also be domestic. He wouldn’t want the democratic spark to reach the Motherland. However, with all due respect to Russia – that’s not the EU’s problem. 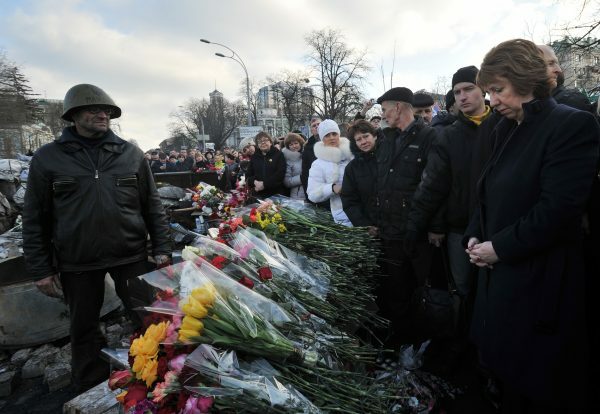 EU foreign policy chief Catherine Ashton lays flowers at a barricade in Kyiv, February 24 2014. Photo: EC Audiovisual Service.